Electronics and me have never really gone hand in hand. I liked the idea and usually could think of a project or 2 that was worth doing - but the practicalities (and the cost) encouraged me towards software engineering. However recently (early 2005) I’ve decided to have another go at it - as I’ve become increasingly frustrated by the limitations and costs of joystick/control systems for the PC and most especially the Sony Playstation 2 (and 1 for that matter). My main gripe was the lack of a decent flight stick for the Playstation. Caroline owns a Playstation 2 - and my ongoing interest in flight sims has led me to buy some of the few flight sims available for it. To be fair - Playstation flight sticks have been made - but are either very expensive or not currently available. Looking at the large selection of PC joysticks available to me - I began to wonder if an interfacing project might be worth doing. However my lack of electronic experience has encouraged me to go slowly as damaging Caroline’s Playstation 2 is not really an option. 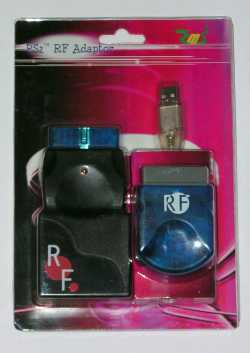 A quick browse of the web shows there is no lack of adaptors to allow Playstation controllers to be used on the PC. One of these seemed like a good first start as it would allow me to test a custom controller without risking the Playstation 2. In the end I decided on a home made version as it was good practice to build and allowed me to easily monitor the inputs. Another option for test equipment is a Playstation 1. 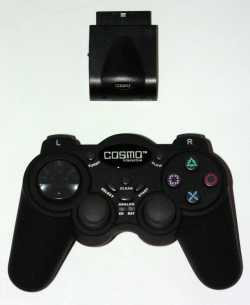 These have a compatible controller interface with the Playstation 2 and can be picked up very cheaply 2nd hand. Integrated - here the wireless adaptor is built into a controller. This is fine if you are happy to modify the supplied controller - but if like me you have existing or multiple controllers - the next option might be better. Separate - here the wireless adaptor is not integrated with a controller. The idea is that you plug your existing controller into this device to make it wireless. This is more bulky and therefore less popular than option 1 nowadays - but is ideal for custom controllers. I’ve so far tested this particular device with my 2nd Atari 9 Pin interface and it worked just fine. Whats in a Playstation controller?